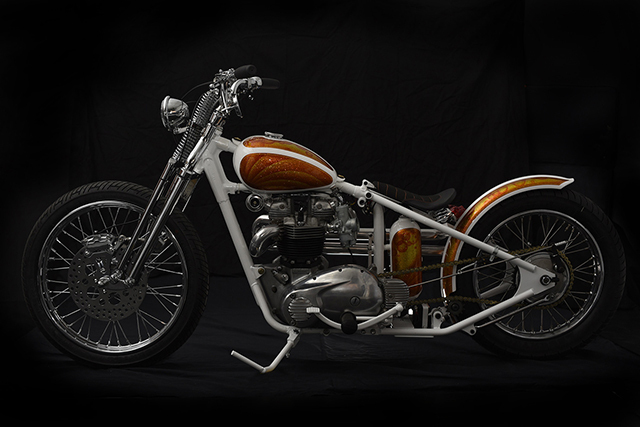 If you had to name your bike after a Beatles song “Here Comes The Sun” would suit this Bonnie Bobber to a Triumph T. Both the bike and song are ’69 models but Rob Chappell of the famous Chappell brothers bought this bike into the 21st century without losing any of the 60’s charm. 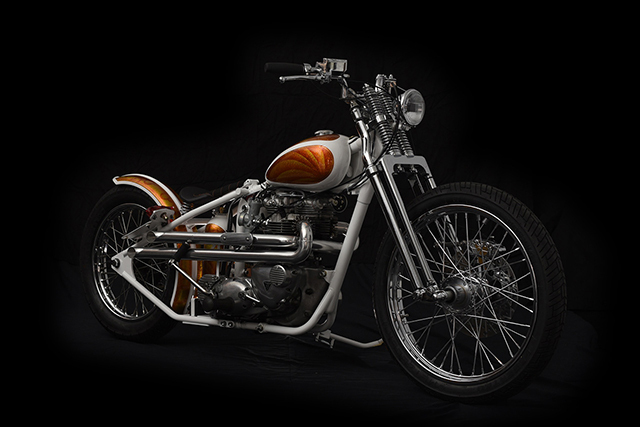 What you might not know is that although they often build bikes together, Chris is in the USA under the Chappell Customs brand while Rob resurrected his forum username of old to brand his Toronto Canada operation Origin8or Cycles. “This makes it easier to distinguish who is building what” says Rob. With the Bonnie completely torn down Rob set about turning the frame into a classic bobber style and nothing says bobber like a springer front end and hard tail rear. 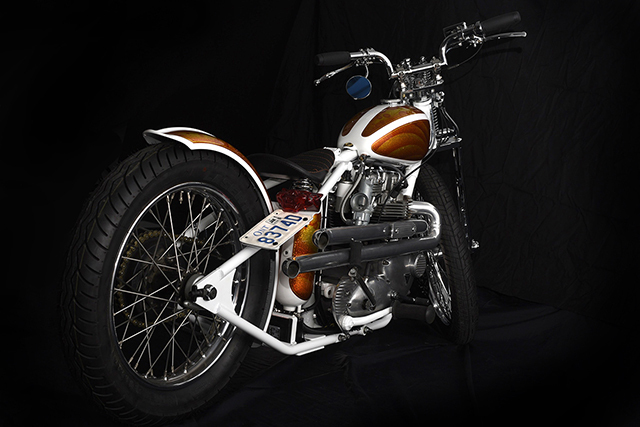 Factory Metal Works supplied the hard tail rear end which measures 4″ stretch and 2″ drop and also provided the perfect rear fender to match. 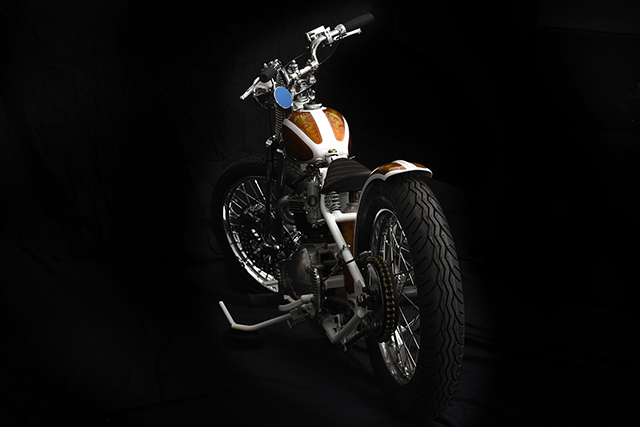 The Springer front end is a Moto-Iron 4″ under stock length Harley items that are fitted with custom bearings to work with the Triumph frame and both mods give the wee ole Bonnie a killer stance. The bars, clamps and cables to work with the new front end all come courtesy of Lowbrow Customs and if you want one of those cool chain tensioners then you’ll need to know it was sourced from Monster Craftsman. With parts out to paint and powdercoat, Rob got stuck into the engine build to bring the heart of the Bonnie to life. Builder and client discussed the idea of going to a big capacity 750cc kit, but with a nice clean engine in their possession the decision was made to stick with the stock item. The cylinders were honed, before new rings and a complete gasket kit were installed. New plumbing lines and manifolds were fitted up before Rob decided to ditch the gummed up Mikuni’s in favour of the classic favourite Amal’s. Tri-Spark electronic ignition provides the spark, while a 200watt stator and new coils, plugs and wires take care of the electronics. Exhausts can make or break a bike and Rob chose perfectly fitting right side high pipes from TFMW. Now the owner has Classic Triumph power without the hard starts and constant oil leaks, Chappell never takes a short cut! With the build having taken place through the Canadian winter Rob was longing for the thawing sun to brighten the finishing part of the build. 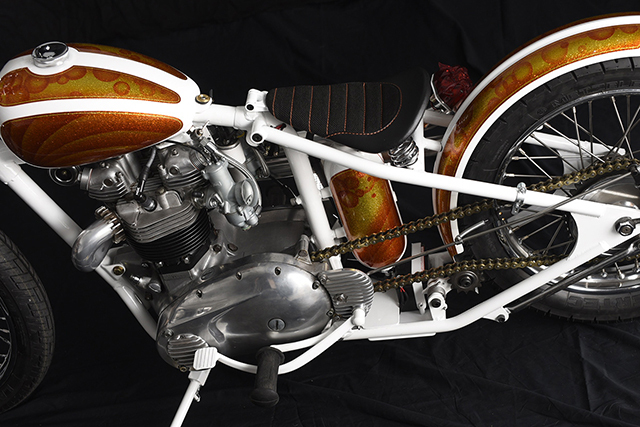 Look back at the paint job; it was exactly that imagery that inspired the paint work on the build. 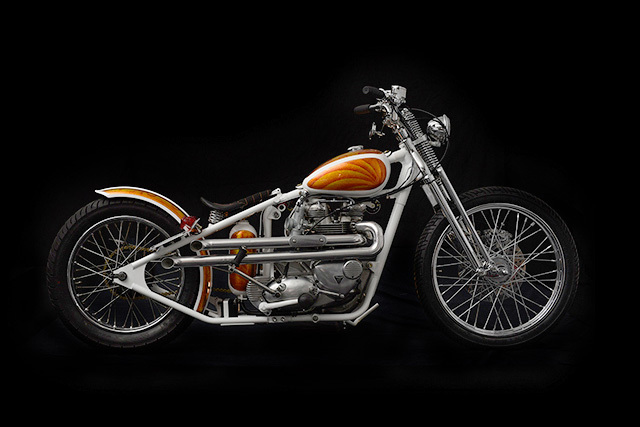 Normally Rob paints all his builds but he’d recently met young spray gun slinger Mat Tobin from Jensen’s Customs, over a couple of beers they thrashed out Rob’s idea and set a timeline. The job is simply remarkable, brutal white like the Canadian snow adorns the frame and hits all of the tins. The bobber perfect peanut tank shows off the rising sun bringing light to the end of the build, with waves of orange and gold, while clever sunspots are incorporated along the top. The theme flows all the way back to the rear fender, stopping along at the custom vertical oil tank that also features a neat replication of the Origin8or Cycles logo. 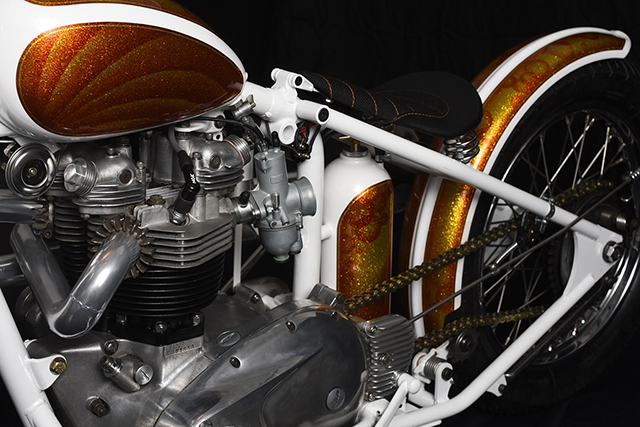 White on a bobber can be a risk, but with the metallic laden orange and gold and the skill of the painter the finished product is absolutely stunning! Then the seat was stitched up by Rob and his brother Chris over at Tuffside – made from custom tweed and leather. 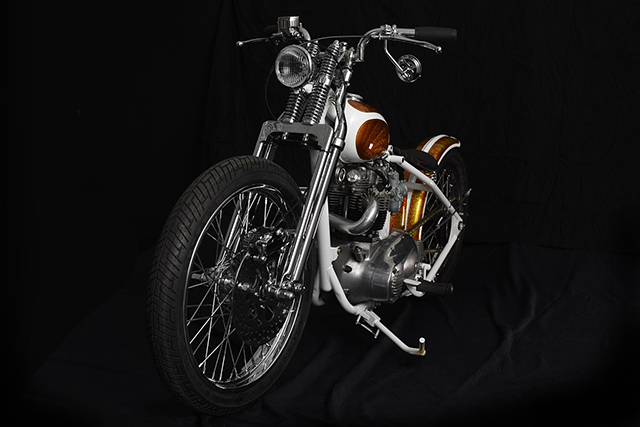 To finish out the perfect bobber look the front is fitted with a 21″ wheel from TC Bros while the stock 19″ rear remained and to match the narrow look of the bike Metzeler Lazertec’s were chosen. One request from the owner was the panther (Cat) tail light which the owner said was original from the 70’s and it strangely works amazingly well. 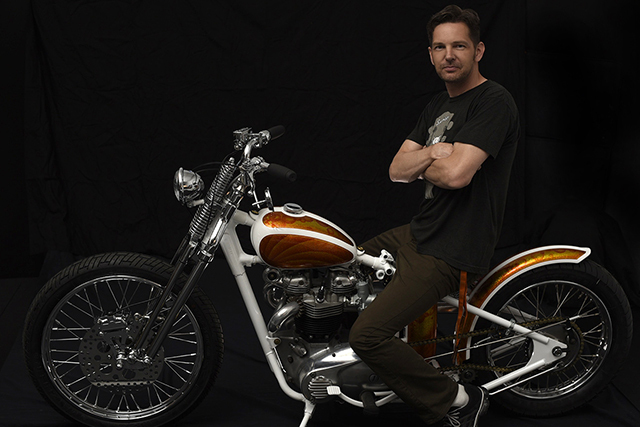 With the build finished and the owner truly blown away by what Rob had achieved in fulfilling his desire for an incredible Triumph Bobber he had one final request. That ’68 Daytona that first brought the client to Rob, he wants that one bobbed now too, because why have one incredible Origin8or Cycles bobber when you can have two!